Stay current on all of Cierant’s exciting happenings. See where Cierant will be speaking and exhibiting next. Gain perspective on marketing technology and trends. While 22% of CPG’s have successfully adopted zero-based budgeting (ZBB) as a revenue growth strategy, other consumer goods companies struggle to implement and sustain a ZBB processes. In order to understand the challenges and strategies for addressing, Shopper Marketing magazine commissioned thought leaders from top consumer goods process consultancies to share their views, including Cierant’s CTO, James Cioban. Check out this Special Report to understand the truths of ZBB and gain guidance on what it takes to succeed, straight from the experts! CIOReview, an enterprise IT magazine, invited their 77,000+ subscribers to nominate companies to be recognized as one of the “20 Most Promising CPG Technology Providers of 2017” for their CPG Technology special edition, published May 3, 2017. Out of over 300 nominations received, their distinguished panel of CEOs, CIOs, VCs and analysts, selected Cierant Corporation as not only one of the 20 to be recognized, but the company to be featured as the cover story. 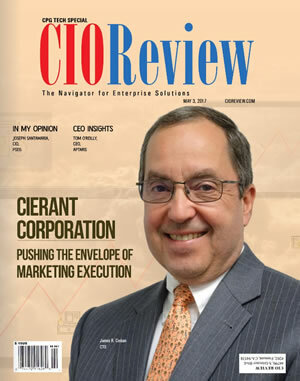 Read on to learn how Cierant is pushing the envelope of marketing execution in the CPG industry from the exclusive perspective of Chief Technology Officer, James Cioban.